KIEV, Ukraine -- Ukraine is showing signs of backsliding on reforms and a cease-fire agreement with Russian-backed separatist forces in the east as Europe weighs in June whether to continue sanctions against Russia for its role in the conflict. 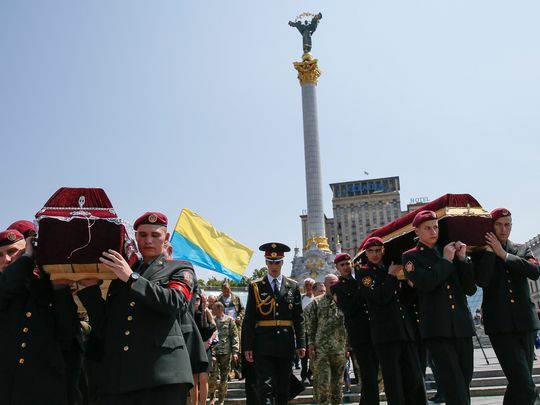 Ukrainian soldiers carry coffins with the bodies of servicemen Sergey Baula,46, and Nikolay Kulyba, 56, who were killed in eastern Ukraine on May 26, 2016, in Kiev. Martin Jaeger, a spokesman for the German Foreign Ministry told Reuters on Friday that his government would back the gradual lifting of sanctions against Russia if it makes progress on implementing the cease-fire agreement. “Sanctions are no end in themselves," Jaeger said. Germany, which has provided support to Ukraine since its conflict with Russia began in 2014, wants Ukraine's government to implement a law governing elections in the eastern regions of Donetsk and Luhansk, which were seized in April 2014 by militants allegedly supplied and backed by Russian forces. Russia, as always continues to lie, and has denied involvement. Ukraine wants cease-fire violations by the militants to end before it passes the election law, Peter Wittig, Germany's ambassador to Washington, told USA TODAY. For the government in Kiev to lag behind on its obligations under the cease-fire “would give additional weight to those voices who want the lifting of sanctions,” Wittig said. Both Italy and Hungary, which seek to resume trade with Russia, have said the renewal of sanctions would not be automatic when the European Commission considers them at the end of June. Russian Foreign Minister Sergey Lavrov said this week that Ukraine has failed to implement its obligations under the agreement signed by the two countries and separatist leaders in Sept. 5 in the Belarus capital Minsk. This week, separatist forces launched an artillery attack that caused the most Ukrainian national casualties in a year. Seven soldiers were killed and nine were wounded in a 24-hour period that ended Tuesday, according to Ukraine’s National Security and Defense Council. Separatists on Friday launched 28 attacks on Ukrainian forces, Ukraine’s defense ministry reported. On May 9, which Russia celebrates as Victory day against the Nazis in World War II, a military parade in Donetsk included tanks and rocket launchers that shouldn’t have been there under the Minsk agreement because of the city’s proximity to the front line, according to media reports and photographs. Other recent developments in Ukraine cast a shadow on the government's commitment to fight corruption and honor a free press, changes that its citizens clamored for when a popular uprising ousted the Russian-backed government of President Viktor Yanukovych in February 2014. Ukrainian President Petro Poroshenko, a chocolate tycoon who rules a country ranked by Transparency International as the most corrupt in Europe, this month oversaw the appointment of a political crony as prosecutor general in charge of fighting corruption. Ukraine’s parliament approved the appointment Yuriy Lutsenko, head of Poroshenko’s party in parliament. Also, the Security Service of Ukraine announced it has opened an espionage investigation of journalists whose names appeared on a separatist database made public by activists linked to Ukraine’s interior ministry. The Organization for Cooperation and Security in Europe, which has been monitoring the cease-fire in Ukraine, called for an investigation of attacks on at least five journalists or media offices in Ukraine since the list was published. France , together with Germany, agrees that the accord should be implemented in full, said French Ambassador to Washington Gérard Araud. Yet, "there is a growing pressure in Europe for the lifting of sanctions, because as you know it's costly also for us," Araud said. The pending election law for the militant-controlled east would determine who is eligible to vote and ensure the elections are fair. If the elections produce a legitimate representative for the breakaway regions, “then some things would be a lot easier,” German Ambassador Wittig said. After elections, Ukraine’s government is expected to proceed on constitutional changes to provide self-rule in the separatist region and amnesty to pro-Russian militant leaders. Pifer said Russia argues that neither side has fully complied with the cease-fire terms. But the European Union is united in the belief that Russia bears primary blame for the conflict, and Russian support for the rebels might have been greater without the sanctions, Pifer said. But Europe is fairly united in the opinion that "Russian behavior might have been even worse without the sanctions,” he said.